January 19, 2017 - Flight TK6491, a cargo flight had departed Hong Kong-Chek Lap Kok International Airport (HKG/VHHH), Hong Kong for Istanbul, the Boeing 747 was was on approach Bishkek Manas International Airport for a refueling. On Monday, just after 7 AM, Flight 6491 crashed into a housing community at the end of runway 26, just a little more than a mile from the western end of Bishkek Manas International Airport. At the time of the crash it was reported the visibility was poor due to heavy fog. Flight 6491 had initially attempted a landing but was force to perform a go-around maneuver as the pilot was unable to clearly see the runway. However, the aircraft was unable to gain enough altitude while attempting its go-around and crashed into several homes in the Dacha-SU community. It has been report among the dead included 17 children and at least 23 houses were destroyed. Although the Boeing 747 was operating under a Turkish Airlines flight number, Flight TK6491 Turkish Airlines has reported this was not their flight and it was being operated by ACT Airlines. Turkish Airlines released a statement on Twitter indicating the flight crew and aircraft was not theirs and calling it an "ACT Airlines accident". ACT Airlines released a statement from the Board of Directors of ACT Airlines - Our company BOEING 747-400 Type TC-MCL registered flag dropped during the landing to BİŞKEK-MANAS Airport on 16 January 2017 at local time with GMT 01.20 (Turkey time is 04.20) while making HONGKONG- BİŞKEK campaign. Captain Pilot İbrahim Gurcan DİRANCI, Second Pilot Kazım ÖNDÜL, Loading Specialist Melih ASLAN and Flight Technician İhsan KOCA, who are on our flight unfortunately, have lost their lives. According to the first information we received, a total of 37 people, 33 of them except for our crew, lost their lives on the grounds that the plane fell into place. 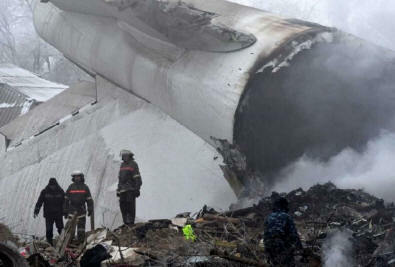 This eliminates the accident in the accident and we pray for our family and Kyrgyzstan's condolences and patience. Clear and verified information about the cause of the accident has not been reached yet. Our two pilot pilots authorized on behalf of our company are at the Manas Airport, along with the authorities, in discovery and detection of the accident. In addition, our technical team has moved to the accident site. The cause of the accident is being investigated by the authorities of Kyrgyzstan and the Turkish Ministry of Transport, and the accident investigation commission of the General Directorate of Civil Aviation. We are in constant contact with the Ministry of Transport and General Directorate of Civil Aviation, our Kyrgyzstan Embassy, Airport Authorities and Kyrgyzstan Civil Aviation Authority for the preparation of the accident report. Clear and confirmed information about the accident will be shared with the public again. The cargo from Hong Kong to Hong Kong-Bishkek-Istanbul expedition was lifted as planned after all the controls were carried out and the Bishkek Airport was infested with no fuss during the flight. The crew rested for 69 hours in Hong Kong before the expedition and took delivery of the flight to complete the 6 hour flight from Hong Kong to Bishkek. The airplane was lifted with a planned total of 85,618 kg "general cargo" load safely. There are no faults recorded in the technical register of the aircraft. A plane crashing; BOEING 747-400 Type is a 2003 model cargo plane with a total carrying capacity of 116.462 kg. As of December 10, 2015, he is in the fleet of ACT Airlines. Like all airplanes in our phallus, all the maintenance of this plane is done in a timely and complete manner. Our team that we lost has been an experienced and specialized flight team that has carried out its professions with great success for many years. Captain Pilot İbrahim Gurcan DİRANCI and Second Pilot Kazım ÖNDÜL are military pilots who have represented us for many years abroad. Our Captain has a total of 10,821 flight hours. Our pilot from the late captain also has 833 flight time experience on this type of aircraft that is crashing. Our second pilot has a total of 5910 flight hours experience and 1771 flight hours in this type of flight. Melih ASLAN, our Loading Expert from the aircraft crew, has been working in our Company since 2007 with vocational training and competence with a total of 14 years of loading expert experience. Our Flight Technician Ihsan KOCA has served as a technician in the Turkish Air Forces for many years and has been serving at our Company since 2006. According to the first findings, it is understood that the formation of the accident is not caused by technical reasons or loading related factors. The actual results of the work will be revealed and will be shared with the public. All losses of life and property suffered by this accident coming from the square are covered by insurance. All damages and personal damages in the accident area are covered by our insurance company and all pecuniary damages will be compensated as soon as possible. We are condemning and sharing our condolences to the Turkish Civil Aviation mosque and the Kyrgyz people, especially those who lost their relatives in the accident with the cause of the accident.